With Thanksgiving and Black Friday behind us, the holiday season is gearing up for a full blast till the end of the year and ushering in a new prosperous year ahead. 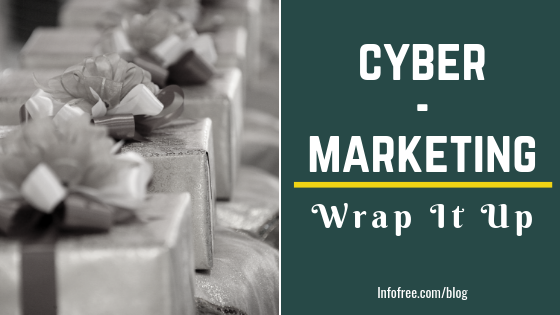 Starting as Cyber Monday, the time span embraced Cyber Week but for the knowledgeable new marketing expert with a discerning eye, Cyber Week is actually a start for the festive weeks to come. Use available tools in the market (for example Google’s) to let your team run a speed test. If your team finds a lag in the load time or other discrepancies, make sure to address them as soon as possible, Remember to run the tests from more than one site. Your team must have a constant monitoring system (you can also use available professional services) to check the website and other virtual platforms your business is using because a few hours of outage can cause a lot of losses and affect visitor frequency. One of the major factors not only with millennials, who are some of the biggest spenders on the web, but also public in general researching for a product, is mobile-friendliness of your virtual pages. All your virtual platforms including your website must be mobile friendly and open with ease and speed. If you have buttons and arrows to click on your website, your designers must make sure that different thicknesses of fingertips are taken care of, especially when your prospects are using mobile devices. Your team has been working diligently but this is the time to reconnect with slow responses or those who haven’t caught on to your excellent services. Make sure to not only communicate what such prospects might have missed out on but also to reach out to all on your lists, provided by Infofree.com, where the business databases, have 95% accuracy and consumer databases approximately 90% accuracy. Now is the time to start on the lucrative offer spree and attaching a few must act Call-to-Action (CTA) positions. Your team must focus now on incentivizing and rewarding customers for purchasing sooner rather than later. Your offers can be repackaged and re-offered under slightly different terms so no need to get a brand new offer ready all the time. With your offers and incentives, another great idea is to optimize particular landing pages for specific offers which searching prospects can visit. Such pages help keep the concentration of the visitors on the products/solutions, they were looking for. Another great way to keep them engaged is to put a timer on the page to highlight to the visitor how time is running out on their chance to grab the deal. Whatever is your offer, make sure to give it a name (for example, Cyber Week offer). As time moves, the offers can be fine-tuned and made to float again as the Year-End offer, Christmas offer and the list goes on. It’s a proven fact that the customers like to call your offer by a title when talking about it or even when ordering it. Your team will do well if it puts into place a skeleton marketing campaign for the coming weeks as you move through this Cyber Week promotions. As the digital rush of the holidays picks up and you handle all the traffic online, your team will do great to keep an eye on the future weeks for advising, rejuvenating and reengaging prospects while offering continuous support and encouragement to your loyal customers. Last but not least is the prompt answering of any questions that the visitors are posing on your website or landing pages. The holiday season is a no-holiday time slot for the experts answering such queries otherwise be assured that your prospects will be going to your competitors. This entry was posted in infofree SMB Blog and tagged Database Marketing, email marketing, Find New Customers, grow my sales, increase my sales, infofree.com, lead generation, mailing lists, sales leads, Sales Productivity. Bookmark the permalink.